· That which doesn’t kill us makes us stronger. Audrey Hepburn was born Audrey Kathleen Ruston on May 4, 1929, in Brussels, Belgium. While vacationing with her mother in Arnhem, Netherlands, Hitler’s army invaded and overtook the town. There was a lack of food during the invasion, and her family had to resort to eating tulip bulbs and bread made from grass. Her small figure, for which she was well known, was due to malnourishment during this time of hardship. Although she was five feet, seven inches tall, she never weighed more than 110 lbs, except during her pregnancies. · Never give up on the things you want most in life. Audrey suffered four miscarriages due to low fat amounts on her body and the stress of her career. However, she was determined to have children and took great care to make sure she was able to carry her babies to full term. She eventually gave birth to two healthy sons, Sean Hepburn Ferrer and Luca Dotti. · Beauty is not just on the outside. · Always give more than you take. 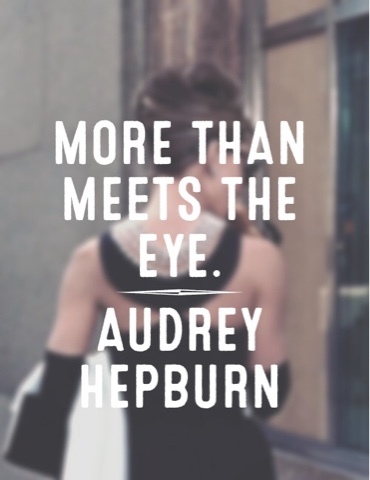 As you can see, Audrey Hepburn was a strong and amazing woman. She had many struggles in her life, but, in the end, she overcame her struggles. Although she was famous, she never let those struggles get in the way of the person she was. She always stayed true to herself and used everything she had to help others who were less fortunate - just as others had most likely helped her when she was less fortunate. I think that's the final and most important lesson we can take from Audrey: Always be true to yourself.